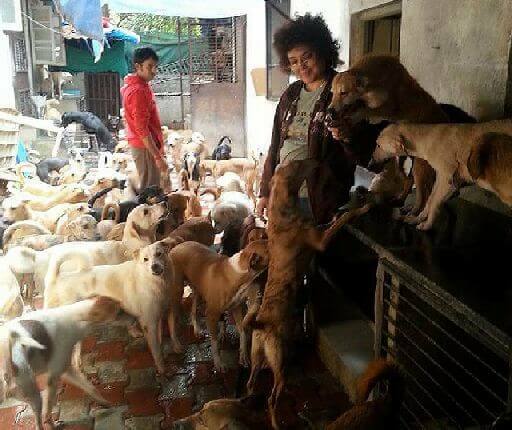 See how this Pune dog lover is helping the stray dogs! There’s this thing about grieving. The world yearns you to snap out of it and yet there in your head you keep playing the elegy on repeat like a broken vinyl record, hoping for a different tune. And all this while you wait and wonder if there’s a way to turn your grief into something positive. 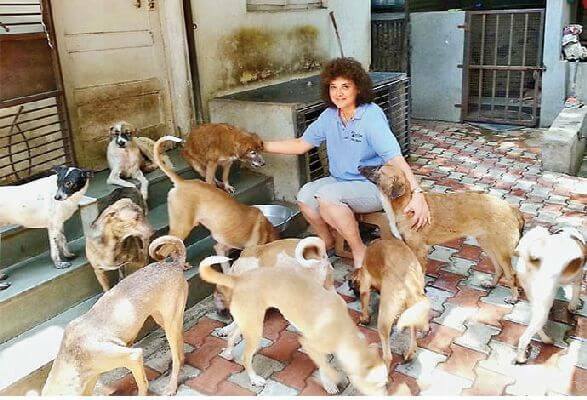 Meet Padmini Stump, the Pune dog lover and founder of animal welfare organization Mission Possible. Padmini began rescuing dogs eight years ago, when her son collapsed in a fatal accident in Dubai, where her family is based. This Pune dog lover is making a gigantic difference to the lives of stray dogs! 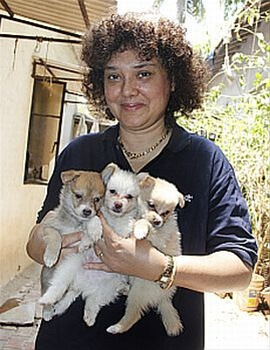 Padmini’s rescued dogs have found parents in Bollywood actors like Nana Patekar and Rati Agnihotri. For over eight years, Padmini and her family friend, renowned oncologist Dr Ravindra Kasbekar, have been looking after the injured and abandoned dogs of Pune. Padmini has built sheds in the open area around her bungalow, Gulshan Mahal, where she shelters the recuperating animals. The modest facility that she started has since become a buzzing rescue and adoption Centre. With nearly 100 dogs being treated and looked after at any given time, and over 1,400+ adoptions till date, Mission Possible is doing great work for the canine cause. What is in it for this lady who hops between Pune and UAE to rescue, vaccinate and foster these homeless animals? Why not stay where her grandchildren are, far from the cacophony of neighbors who can’t understand what she does. Padmini keeps coming across poignant lives of pawed pals – dog with an ear blown off by a firecracker, dog with his eyes gouged and a multitude of road injury cases. Thanks to the care that these patients receive at Mission Possible, they get a second lease of life. In a slow manner, they have also taken to trusting humans, all over again. However not everyone has celebrated this kind woman’s spirit, she has met with resistance from neighbors who complain of ‘noise’ and ask her to not nurse injured dogs in her bungalow. Dog with Blog urges our Pune readers to please help this kind lady via volunteering at the shelter or by adopting one of the Indian dogs Padmini so lovingly cares for. We are sure that like Padmini, you too would rediscover your smile in the jocund company of the canine. Dr. Kasbekar who cares for the dogs between his surgeries at the city hospitals, helps with sterilization of street dogs as well. Posted on July 19, 2016 Author Abhishek JoshiCategories Hail the hound! May I please have your email id? Please can i volunteer at your place? Hi Meghna, we don’t have a physical facility as such… we work as a network of dog lovers spread across the country. I would like to learn, explore and experience with you. Request you to contact Mission Possible (91-9921881894) or a Pune based vet urgently! If you find a dog with a deep wound, please do give it IVERMECTIN or Ivermectol or Ivoral Forte. That simple medicine can prevent maggots which settle in deep wounds and kill the dog by eating its flesh. We can’t always take in strays, but we can give a medicine and prevent it’s suffering. It needs usually just one administration. There are a lot of stray dogs in our society. I don’t want them to be hurt but they are scary for children and people like me who fear dogs. Is there a place where we can give them for adoption? As a society we would love to contribute for their vaccination and wish that they be adopted by people who really love animals. You can also lodge a complaint with police. I am trying to call all the rescue organization but nobody is picking up the phone.there is a dog injured near swami narayan temple narhe gaon pune he is not able to move I think he had an accident he is in pain please help him. There r 5 stray puppies in my society. Can u suggest any organisation who will give shelter to them. We don’t have a physical facility. Please contact Mission Possible or a local vet at the earliest. Hi Prachi, Request you to take him to a vet near you at the earliest. You may then contact Miss Padmini at +91-9921881894. Hi…There are some stray dogs in my society..They are harmless and loving…but some of the residents are creating havoc because of their ignorance…can you direct me as in how to protect these strays ? They are just as loving and loyal as any pedigree. In my colony there are three dogs who are now very sick from last two days. Can someone come ahead for their treatment. Please its an request. Today I saw one stray dog puppy badly enjured (back side leg) @ Wagheshwar Parking, Wagholi Pune. Please help that puppy. Previous Previous post: How to take care of your dog in monsoon?